Roller skates for kids is a hot topic here at Devaskation! Skating is an incredibly fun sport and hobby for people of all ages, and is safe and fun for children, even at a young age. Devaskation offers the best quality skates to assure your child is safe, comfortable, and confident while learning to skate. The question for many parents is what to consider when buying your child their first pair of skates. See the tips below to guide you through purchasing the perfect pair of skates for children at any age! Make sure you read our Kids Skates FAQ before you move on to this article. Also, keep in mind that this article is a "living article" that changes as often as the industry changes so check back often for new information and recommendations. What is Your Favorite Skate for Kids? What Kind of Skates Should I Get for My Child or Teenager? There are two main types of skates available for a child or beginner skater. Quad skates, or the original “roller” skates (typically seen at indoor roller rinks), and Inline skates, or “rollerblades." Quad skates are typically more conventional, and are usually the recommended skate for young or beginner skaters. Quad skates have four wheels, 2 in the front and 2 in the back, which provide a better balance point than inline skates. Inline skates typically have 4-5 wheels in a line, which don’t allow for as much balance while not in motion. Quad roller skates give kids and skaters in general a sense of standing in a normal position – similar to wearing tennis shoes – but with wheels on them. Inline skates can be difficult for children because they usually have less strength in their ankles and legs. This makes it more difficult for them to stand upright and steady on the inlines. Without some practice on skates and building muscle strength, inline skates for children may not be an ideal first skate, but usually teens can handle inline skates. There is a chance an inline skate could cause the child's ankles to “buckle” and cause their knees can turn in. It must be said, however, that inline skates might be the right skate for your child if the child is already comfortable skating. Personal preference and comfort is always something to consider for anyone buying skates for kids. How Do I Choose the Size and Features of Skates for My Child? Skates for children are made in smaller sizes and have boots that conform to the child’s feet and ankles. This ensures the child is stable and confident on the skate. For teens, however, roller skates are more varied and are usually made for teens and adults. Inevitably, kids are going to outgrow skates. Just like tennis shoes, you might want to buy them a little big. Luckily, there are lots of affordable skating options for children and we even offer kids skates with adjustable sizing to allow for growth – check out our selection of Kids Skates to see these great options! In general, skates for young people can be bought about one size bigger and still be okay for skating. It is not recommended to buy skates more than one size bigger, as it can hurt a skater’s feet and ankles. A loose skate will cause blisters due to the slipping and rubbing of the over-sized skate. If you buy a larger skate, it is important keep the laces tied tightly for the best support of the feet and ankles. Using extra socks to pad the extra space in a larger sized skate is not recommended because it can actually create more moisture inside the skate – another source of potential blistering and athlete's foot. The following video gives information on purchasing kids skates. The gentleman in the video is a 3-time world champion skater and owner of Devaskation -- Skip Clinton. Let's Go to the Skatepark! Pre-teen skates are an important because they help your child transition from kids skates to adult skates. This makes for the trickest purchase because of the value vs. quality conundrum. Kids' skates often have adjustable sizing, but in the age group for 8-12 year-olds, adjustable sizing isn't available. Because the child is growing quickly and pre-teen skates do not offer an "adjustable" sizing option, parents often spend money on skates that the child will quickly outgrow. However, buying skates for children at this age is important if the skater intends on skating after the age of 12. The Phreakskate Ghost is an excellent choice for a pre-teen skater. It is an extreme value and provides plenty of speed, support, and style. These skates have low-cut boots that will help your child build up ankle strength for speed skating and features name-brand components that are considered "above average" in all areas. The wheels on this skate are okay for outdoor skating, but actually intended for indoor rink running. Feel free to add your own custom laces to get a little more style and variety. We sell other colored skate laces and recommend the Spark Derby laces because they are extremely durable. The Phreakskate Devaskator is another great choice for kids and features outdoor Zen wheels. Jackson is an extremely popular skate line and has been in business for decades. The brand is well-recognized for being a premier skate for all types of skaters. The Phreakskate Devaskator is no exception. The boot is made for skaters that love to skate outdoors! This skate can be used indoors or outdoors, but the wheels are more suited for outdoor skating. Don't forget, you can easily swap out the wheels for indoor wheels if you contact us and let us know. It's smart to buy both indoor and outdoor wheels so you can swap them according to your needs. Some of our best-selling children’s quad skates are the Crazy Flash Kids Skates and the Epic Galaxy Elite Skates. All of our Kids Skates offer the best in comfort and quality. The Crazy Flash Kid's Skate is perfect for children, as the wheels are non-damaging to inside surfaces as well as outside surfaces. This skate can be used inside or outside. The main feature of this skate is the light-up and flash lightening bolt on the side of the skate. With motion the skate lights up and kids love it! This is a great skate for a skater that is just starting out. At under $80, this is one of the best beginner skates we carry. You can see a quick youtube video of the Crazy Flash Skates. One parent’s review on DevaSkation.com states how much her six-year-old daughter loves these skates, and her parents were equally happy with the price and quality! The Epic Skates Galaxy Skate is a great skate to start kids on because it offers foot and ankle support and plenty of room to grow! The skate has laces to hold the foot secure and a velcro strap for ankle support. This combination also helps kids that aren't able to tie their shoes into the skates. The wheels can be used outdoors, indoors, or at the skating rink. Please be mindful that the skates are intended to help your little one learn to skate and are not going to meet the expectations of a child that is 6-8 years old with skating experience. The Crazy Flash Skate mentioned above would be better. The Epic Galaxy Elite skate comes in two models -- one for boys and one for girls. It is a very highly rated skate for children. Click the link that suits you best -- Epic Galaxy Elite Girl's Skate -- Epic Galaxy Elite Boy's Skate. The Epic Blush Skate is another great model of skate that might suit your needs. The Epic Blush quad roller skates are a fantastic skate for youngins to start off their skating career. The fun design and outstanding color options are perfect for our smaller humans. All in all, these Epic Blush quad skates will be an incredible addition to your minions dialy adventure pack. Recommendations for kids "light-up" Quad Skates! Want your child's skates to light up and sparkle? We have several options for light-up skates that will turn your kid into a superstar at night or at the roller rink. This is a high-top skate in a more traditional style, but it has plenty of flare with it! The Crazy Disco Skate uses a LED to light up and flash a rainbow of colors. The light-up LED shimmers brightly with movement, never has to be charged, and lasts for 50,000 hours! As noted, these skates are intended for girls and will probably suit girls in the age range of 6-10. There should be no issue with these skates being used outdoors or indoors. The Epic Allure LIght Up Skate is another great model of skate that might suit your needs. The High quality 3/4 boot provides plenty of ankle support and prevents heel slip. The lightweight nylon plates make these skates perfect for younger skaters. These skates come with amazingly bright LED light up wheels, for fun and safety. The Phreakskate Ravenous skate is comprised of quality components at an extreme value. The boot is a Jackson Rave boot that is comfortable and durable and perfect for new or beginner skaters. This skate comes with Seba Luminous light up outdoor wheels that are great for outdoor skating! The skate has upgraded Bionic Abec-7 bearings so you know you'll fly down the streets! Starting your child on skates at an early age will give the child an advantage later by developing the muscles necessary to balance and maintain control while skating. Admittedly, our website is not directed toward children or young children's skates. It is instead directed toward high-end skates and experienced skaters. Therefore, there are a FEW external links on this page to products listed on Amazon. The products are highly rated and should suit your needs. Please trust that any external links are our recommendations, but we do not carry, stock, or support the skates listed on Amazon. Any skates purchased on our website are supported and usually in stock. Some of the most popular skates for young children are the Disney Frozen Skates with Pads and the Teenage Mutant Ninja Turtle Skates. Obviously, Frozen and TMNT are very popular right now and these skates feature the characters from Frozen and TMNT. The Roller Derby Girl's Fun Skates and the Roller Derby Boy's Fun Skates are padded for great comfort and adjustable so your little ones can use them as they grow. The Tour Code 7 Inline Skate is without a doubt one of the best entry level skates we have ever seen. This skate features a lightweight TUFF-skin exterior wrapped around a heat moldable boot and features High density memory foam ankle pads, Tour one-piece Traxx Tongue, comfort pillow padding edge and a TRICOT Liner. The moisture wicking material helps keeps skaters feet dry all game. All of this is mounted on a Tour Tri-Coil XT Eviction Aluminum Chassis rolling on Tour Force Speed Formula Indoor/Outdoor Wheels installed with BEVO Silver-3 Raced Rated (Chrome). This incredible combination and price point make this the perfect skate for the entry level skater who is unwilling to sacrifice quality. The Roller Derby Aerio Q-90 Inline Skates are a comfortable semi-soft skate. This skate is built with an aluminum frame and 84mm Pro Series wheels with Bevo Abec-9 bearings. These skates have great stability and control, giving you the confidence to skate as quickly as your heart's content! The Luigino Kid's Adjustable Challenge Package includes the NEW Luigino Kid's Adjustable Challenge Boot for growing kids! Keep your kiddos in a comfortable and supportive skate with the neoprene lining and a shell that is actually molded for childrens feet taking into account the less developed structure of a childs foot. Attached to this boot is the Pilot Striker Frame, made with ultra strong, lightweight heat treated aircraft aluminum. Roll in style on our favorite outdoor wheel, the Atom Matrix Wheels which are great for indoor and outdoor skating. The Roller Derby Ion Adjustable Inline Skate comes in both boys and girls models and makes a great inline skate for kids because the sizing is adjustable so that the skate can grow with your child. This saves your money and allows the child to spend a lot of time on one skate instead of switching out and breaking-in new skates every year. These skates aren't going to last forever though and if your child likes inline skating a more expensive option will be necessary as the child grows and gets better at skating. These are an entry-level inline skate. If your child is serious about inline skating, the SEBA Adjustable Inline Skate (high end) is the solution. These are serious skates for kids that want to take their skating skills to the next level. The skates are more expensive than the "roller derby" brand, but they are made for shredding. What Quad Skates are Best for Junior (Teens) Roller Derby Players? Young or “Junior” Roller Derby skaters need a skate that is able to withstand the higher impact of the sport. This will be a skate that holds up well, while also allowing the Junior derby skater to perform comfortably and at a premium level. Wheels and bearings are an important factor in choosing derby skates, and we recommend referencing the previous articles “How to Choose Outdoor Wheels” and “Guide to Roller Skate Bearings”. Our recommendations for the best derby skates for kids are below! The Phreakskate Derby Hybrid skate is a popular entry-level derby skate. The term "Phreakskate" is given to a skate that is comprised of many different high-end parts from different manufacturers. It is also popular for adults as a derby skate. The Mota Hybrid wheels on this skate are a favorite of many derby skaters because they grip on slick indoor concrete surfaces and are an improvement on the ever-popular atom poison wheels. The Jackson Frankenskate Derby Hybrid comes with a comfortable boot made by Jackson (a leader in skate boots). It also comes with a Mota Monster toe stop that makes it very durable and dependable. The Atom F1 Viper Poison skate is a popular derby skate. This Luigino boot is amazingly comfortable, making it popular for adults as a derby skate also. The Atom Poison wheels on this skate are a great for indoor and outdoor surfaces, are available in three sizes, and come in two awesome colors. The Mota Black Magic Savage Skate is everything you would expect from Mota Skates at a price that is truly unbelievable. The Mota Mojo Boot Line is the best of the best and now you can combine the new entry level, all black Savage boot with the Mota Boss Frame and choice of Mota Toxic Wheels. This package is your chance to get the skates of your dreams for a price you'll love! 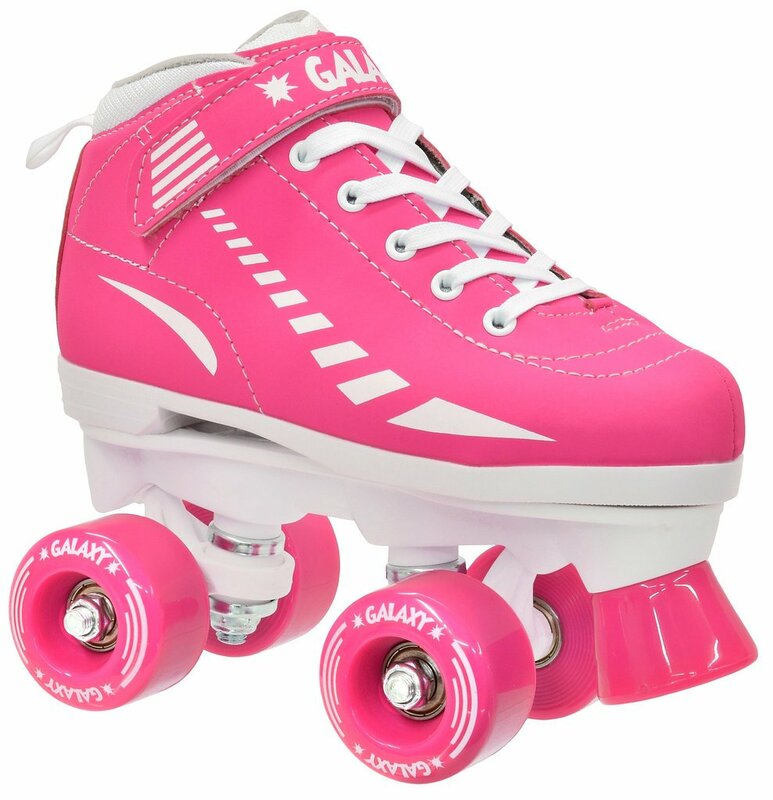 What Quad Skates are Best for Juniors (Teens) at the Roller Rink? If your pre-teen or teenager is interested in skating, it is important to keep in mind quality, sizing, and style when choosing a skate. At this age, kids are generally very conscious about what they wear around their friends. Therefore, you should keep this in mind when choosing a skate. It's best to go with a well-known brand for general skaters. You shouldn't break the bank (and you don't need to) when buying skates for kids because kids typically grow out of the skates in a year or two. Therefore, you need a solid value on your purchase. The Phreakskate Rink Runner skate is an insanely popular, entry-level skate and is our best-selling junior speed skate. Jackson is a brand you can trust and they have been in the business of making skates for nearly a century. The wheels on this skate are rated for indoor use, but you can easily swap them out for Atom Pulse wheels and make this skate perfect for outdoors. If you would like to customize the skates with different colored laces or toe stops you can do that too! This is a dependable skate and typically purchased for skaters that like rolling around the rink on the weekends. Usually recommended for kids age 10-16! The Riedell R3 Skate skate is a very good skate for the price. It has an amazing value compared to some of the other brands. Riedell is one of the most popular brands for quad skates today and we've made so you can customize almost every part of your R3 so your big kids (or you) can express your own personal style while you skate! The Jackson Rave Snap Rink Skate is the new entry level quad roller skate from Jackson. Constructed from premium vinyl materials, a PVC sole and the Jackson Plate, this skate is a great beginner package for kids, juniors (teens), and adults. With multiple options for customizing this great skate, you're sure to find that you can mix your own personal style with an awesome skate package! Tip: If you or your child is interested in skating outdoors, you might pick up a set of Atom Pulse wheels because they are designed for outdoor use and will last a long time! Do you want to skate all night long!? Then you might also use Luigino's booties inside your socks to keep from getting blisters! Recommendations for Junior (Teens) Rhythm Skates! The Riedell Boost Skate is a favorite for rhythm and jam skaters because of the high quality boot and components. Wide feet typically fit well in these skates. The skate is loaded with PowerDyne Thrust Nylon plates, Radar Riva Indoor wheels, a jam toe stop, and Kwik bearings. If your pre-teen or teenager is interested in rhythm skating, the Riedell Angel Skate is a great choice! This skate is composed of Radar Riva wheels in some great colors, Kwik Abec-5 bearings, and Powerdyne's Thrust nylon plate. The Moxi Beach Bunny Vegan Roller Skates are more affordable than the Moxi Ivy and just as awesome. The Beach Bunny drym-dyed vinyl boots are attached to smaller outdoor wheels for bouncing around town and dance skating when you feel that beat. You'll love the glitter polyester laces and brand new Moxi Dri-Lex lining. These skates are available in Peach Blanket, Periwinkle Sunset, and Blue Sky which are all available in sizes 1-10. These animal-friendly skates also come with an extra pair of toe guards for the park skater you know you want to be. What Quad Skates are Best for Junior (Teens) Speed Skaters? Junior speed skaters should look for a light-weight skate and boot that offers support and comfort for the foot and ankle. Wheels will differ based on what type of surface the skater will be skating. Indoor or outdoor speed skates vary, but overall the key is to think about what will best support your child’s knees, ankles, and feet and still provide superior performance. Grab these Jackson Competitor or Elite Viper Alloy Skates with the Juke Alloy or ultra light Savant wheels for the ultimate speed. A great combination of the Jackson Competitor boot with Auqa-Tech heat molding technology for the perfect fit, and the Viper Alloy plates made from strong and lightweight F16 - Extruded Aluminum makes this a fantastic addition to your gear to take your performance up a notch. The Phreakskate Motavation, like all of our Devaskation Phreakskates, are built with top-of-the-line components from the best manufacturers in the skating industry. This skate includes the Mota Mojo Silver boot, Mota Boss quad plates, Atom Boom X-Firm 62x44 wheels, Bionic abec7 bearings, and a Mota Monster toe stop so you have a top-of-the-line skate at an amazing price. The components purchased separately would cost well over $750. The Phreakskate Brutal Beauty, like all of our Devaskation Phreakskates, are built with top-of-the-line components from the best manufacturers in the skating industry. We started with the Jackson Vantage Boot that provides comfort and performance with a great look. The Pilot Viper Plates are lightweight, strong and designed specifically for performance skaters. The Pilot plate has 16 degree double-action adjustable trucks with high rebound bushings. Combine that with the awesome new Savant wheels and The Phreakskate Brutal Beauty is the lightest most agile Phreaskate yet. The Seba FRX-84 is a great inline skate for teens and young adults. SEBA is one of the best in the industry for high quality inline skates. The FRX is their mid-grade skate with stunning performance and quality. You will love how comfortable this skate is! The Seba FR 2 80 Skate is an urban inline and one of the best quality, affordable freestyle skates out there. These awesome skates are a breeze to put on and stay comfortable for longer periods of skating. The Tour Code 5 Inline Hockey Skate s hands down the best inline hockey skate in its class. The chassis is a Molded Carbonite Quarter Panel Construction and has been CNC extruded for concentrated boot to chassis power transfer creating flexibility but rigidity where needed to eliminate power transfer loss. The interior is constructed using a comfort Quilted Tricot Liner and features high-density memory foam ankle pads, a comfort pillow padding edge and is heat moldable for a custom fit every time. What Inline Skates are best for Juniors (Teens) Speed Skaters? Speed skates can be expensive because they are typically engineered to be light-weight and durable. They are designed to provide stellar performance and this means the cost of the skate is usually higher than skates that are designed for skating around a rink or outdoors. The Atom Pro Package will change inline speed skating as we know it. This skate is a complete, high-quality, entry-level inline skate package from a name you know and trust; Atom Skates! Get the great Atom Pro Carbon Fiber Shell and Heat Moldable Boot (Available in sizes 6-13), Atom Pro 6000 Grade Aircraft Aluminum Frame 12.8 4x100, Bionic Abec 7 Bearings, and 100mm Green Atom Matrix Wheels for an unheard of price! The Luigino Strut 4-Wheel Inline Skate was built by a world-champion speed skater, Doug Glass. These skates are no joke. They are designed for skaters that want to push the limits of speed. The Strut 4 Wheel Package includes the popular Strut Boot by Luigino, which maximizes comfort for skaters, and a Pilot Striker frame, made with ultra strong, lightweight heat treated aircraft aluminum. The SEBA Marathon Speed Skate is one of the only high-top speed skates on the market. This is advantageous to newer inline speed skaters that still need ankle support. Advanced Skates for Juniors (Teens) - Let's Go Big! So your teenager is an awesome skater already? Need to dial it up a notch? If you're in need of high-end, professional skates we are the company for you! We specialize in the very best. There are several brands that epitomise high-end skates in the market today. Those brands are Atom, Riedell, and Mota. Atom and Mota were both founded by world-champion speed skaters Julie Glass and Doug Glass. This duo has been making the best in skates for a decade and very few brands can compete with the quality and performance of Atom and Mota. Riedell is also a great brand that has been in business for almost a century. With your Mota Quad Skate, you'll have the lightest quad boot in the world and the ultimate quad plate! There are dozens of colors to choose from for almost every piece of the boot and now you can even do a custom print guaranteed to set you apart from every other skater. Don't forget to customize your awesome new skate so it shows off your personal style! You can even grab some great Mota wheels to put on your amazing new skates. With your Phreakskate Predator, you'll have everything you need. Slip your foot into the Mota Savage Boot that provides comfort and performance with a great look resting on a Crazy Skates Apollo Plate or Pilot Falcon Plate in some amazing color options! Combine this with the awesome new Savant wheels and The Phreakskate Predator is the lightest performing Phreaskate yet! Add the Bionic Abec 7 bearings and a Mota Monster toe stop and you have a top-of-the-line derby skate at an amazing price. The wheels alone retail at $100 and all of the components purchased separately would cost almost $400. Don't miss your chance to snag this awesome Antik MG2 aggressive skate from GrnMnstr! This skate comes with the all new Antik MG-2 Boot, a Powerdyne Reactor Fuse Nylon plate, Moto deluxe bearings, Gumball toe stops, and your selection of CIB wheels! Already have your tricks down and need a stronger plate? Upgrade to the Reactor Neo Aluminum Plate for even more strength! The Moxi Beach Bunny Vegan Roller Skates are more affordable than the Moxi Ivy and just as awesome. The Beach Bunny drym-dyed vinyl boots are attached to smaller outdoor wheels for dance skating and hitting some tricks. You'll love the glitter polyester laces and brand new Moxi Dri-Lex lining. These skates are available in Peach Blanket, Periwinkle Sunset, and Blue Sky which are all available in sizes 1-10 so both little kids and big kids can enjoy them. These animal-friendly skates also come with an extra pair of toe guards for the amazing park skater you know you want to be. The Moxi Lolly Roller Skates are made with a high-top, suede leather boot that comes in a variety of colors. All of the skates in the Moxi Lolly line come with a powerdyne triton metal plate with off-set adjustable toe-stops and stabilising foot plate. Grab your pair with Moxi Trick Wheels to set yourself apart from other kids at the skatepark. Any parent will agree that quality protective wear is essential. Mouth guards and helmets protect skaters from getting a concussion, pads protect against bodily injury, and more options of protective wear allow for an absolute safe skate. DevaSkation offers helmets, mouth guards, wrist guards, elbow pads, kneepads, knee gaskets, custom packages of items, and offer them for all ages and sizes. We've listed our favorite for kiddos in each major category below so check be sure to check them out and you can check out even more information in our Guide to Safety for Skaters article. Helmets are of the utmost importance in skating. After all, protecting the head and brain is essential to avoid concussions, brain injury, and head injury. One fall without a helmet can be extremely dangerous and have lasting effects, should your head take any unnecessary impact while skating. Concussions are increasingly common in not only skating, but also many popular sports today. The best prevention is to wear a helmet like this >Triple 8 Dual Certified Helmet. We have all types and sizes of helmets to suit your skating needs. Mouth guards protect skaters from hurting or even loosing their teeth while skating. Due to the increasing popularity of skating, mouth guard technology is increasingly innovative. Instead of the old, bulky mouth guards that veteran skaters are used to, today mouth guards are thin and moldable with a soak in warm water. Mouth guards suction to your teeth, and no longer need to be removed for a drink of water or in order to talk. We offer an awesome SISU Mouth Guard Starter Kit so your little one can stay safe while also keeping it clean and fresh (well as much as possible for the active kiddo). Wrist injuries are among the most common in skating. Wrist guards protect against damage to the wrist tremendously, and are extremely affordable. DevaSkation offers high quality wrist guards with sizes for children and adults. Knee pads are so important, as skating can put a lot of pressure on your knees. Knees often take intense damage from falling, and the recovery time needed to heal knee injuries is not short. We offer the best brands in knee pads on the market in order to keep you skating comfortably and safely. Pads simply protect your body from injury upon impact. As any skater knows, elbow pads are very important pieces of protective wear for all types of skating. Elbow pads protect your elbows from hitting a hard surface, and should have a snug fit and thick padding, as well as hard caps. Check out this 187 Junior Tri-Pack for a great starter set for your little one! Please refer to our article “Skates for Christmas” to find out more about great skates to gift your children. This fun, recreational sport and hobby is sure to be a great pastime for you and your child alike! We offer many skates and skate parts to customize and stylize the perfect skate for even the youngest skater.